Guess what flavor I made? If you follow me (or any other Daring Baker) on Twitter, you’ll already know that many of us did not care for this recipe. It flat out did not work for most of us (including myself). I tried it. It didn’t work. I could see many reasons it wold not work as I was making it but went ahead anyway. And then I wished I had just saved the time and ingredients. The marshmallows may be a little thick, but, then again, there's really no such thing as too thick a marshmallow. So why are there pictures of somewhat-successful macarons here? After tossing the completely failed macarons into the trash, I started over. With my school’s recipe (which I will not be sharing, since I’m not really supposed to do that I think…it is VERY close to the one I’ve used in the past though). I still didn’t have complete success but they came out MUCH better and I was able to put a few together – and some even came out well enough to take pictures! How'd I get them to stick in there? GANACHE! Of course this was all after I’d already thrown a fit about wasting my entire Sunday on something that was only barely successful. If I were the type of person to get embarrassed, I would be. Horribly. But I don’t really do embarrassed. I move on and set up a few shots anyway. If you still can’t tell what flavor they are, they’re hot chocolate macarons with vanilla bean marshmallows in the middle. I put hot chocolate mix in the shells (substituting it for 10 grams each of almond flour and powdered sugar), spread ganache on the insides to up the chocolate flavor and anchor the marshmallows in place, and dusted them with a little extra mix right before serving. I also served them WITH hot chocolate and marshmallows. Extra marshmallows means more hot chocolatey times for me! If they’re not chocolatey enough for ya, just dunk them in the hot chocolate. It worked for me! hot chocolate and marshmallow macarons? wow what a great flavor combination. love this! wow. I would love to have one. they look divine. 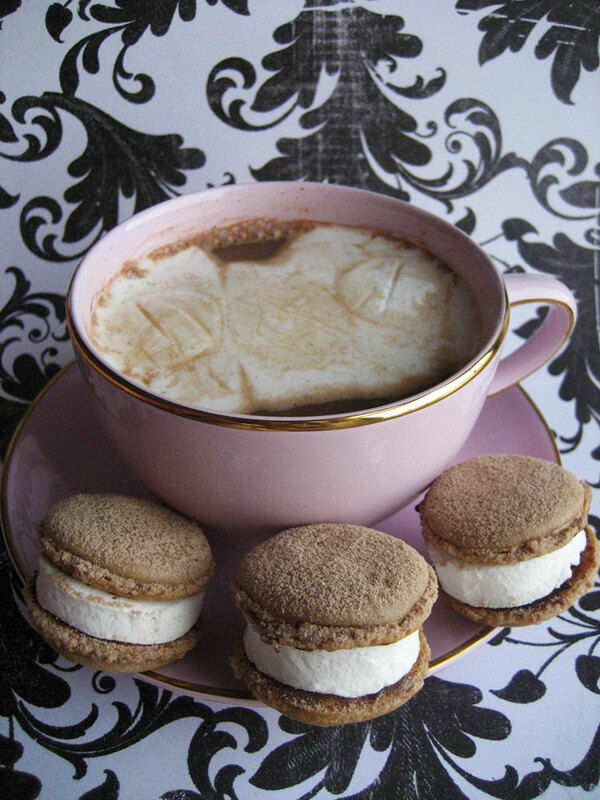 Hot chocolate & marshmallow macarons. What an amazing flavour mix. They look so cute too. I love it. I love a generous macaron! hehe. What a great combination, especially for this fall season. Great Idea ! love the marshmallows as a filling. Cute idea to use marshmallows! I couldn’t get the DB recipe to work for me either. Yours are so cute, and what great flavors! Very pretty, I suspect the macaron journey is a very long one and that most people have scraped together the 3 or 4 successful ones for a photo! My feeling is that these things are really temperamental, and that even a recipe can be inaccurate until you adjust for the exact ingredients. I dont have the time or patience to repeat over and over to get the right product! I am hearing lotsa raging about this recipe!! hehe I didn’t use it I used my tried and trusted ratios from Syrup and Tang. Google them up! They’re super fool-proof imo. Oh, my! Are these ever cute! 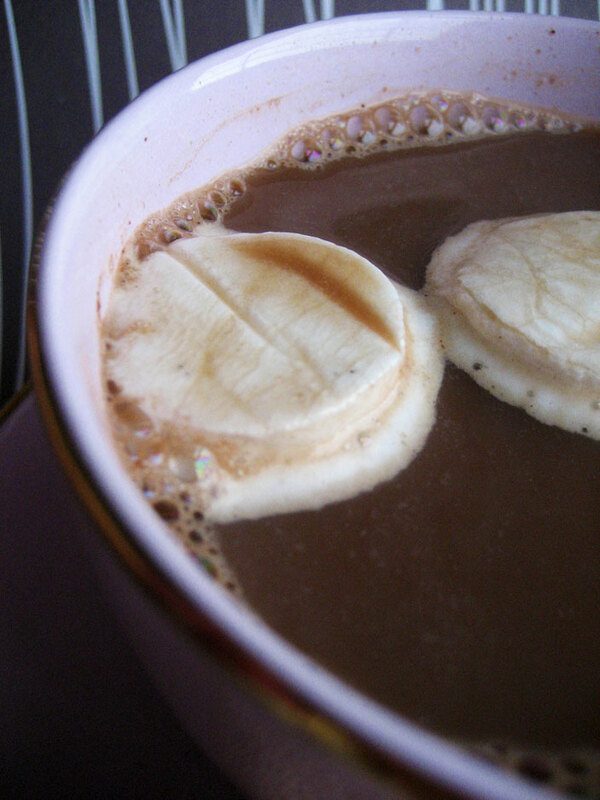 I love your idea for the marshmallow in the middle with the hot chocolate flavor. very clever! Interesting idea with the marshmallows and hot chocolate idea :) Have yet to see one like it! I share your sentiment about the macaron process, for sure! Your final results look great, though – love the marshmallow. Yep, that recipe was a dud for me (as you know). But I LOVE that flavor combo – how clever! And an excuse to have hot chocolate with them – it’s just perfect. What a great idea and I bet they teasted great. Cheers from Audax in Australia. Oh how lovely! Very original idea ;) They look beautiful. Now I’m craving hot chocolate!!!!!! I did marshmallows to fill them too. looks great and totally agree about the recipe. Love your combo; makes me want these by the fire with the snow outside…nice. I think the only thing that kept me from totally losing it the day I made mine was that my son had a friend over. I used a different recipe for my second attempt too and worried about getting busted over it. But it seems like a lot of people did. Yours are making my mouth water. I am a marshmallow addict. Which is funny, because I hated them when I was little. You made smores!!!!! How cool! I’ve never made these things, I really need to. Wow! These sound awesomely delicious! Great idea for the flavors & marshmallow! I’m also glad to hear that I’m not the only one whose macarons failed miserably! O. M. G. if i have any say over it you win for best flavor combination. i’m totally stealing your idea…and how perfect for the upcoming cool weather! so you mean–you’re hosting the next challenge!?!?! Wow! Mashmellow and hot chocolate macarons!!! Can I ahve some? They are perfect macarons. Very nicely done! This looks so comforting :) Also for some odd reason, they remind me of donuts – not always a bad thing! I’m looking out my office window at a cold and rainy day, dreaming of just this kind of treat. 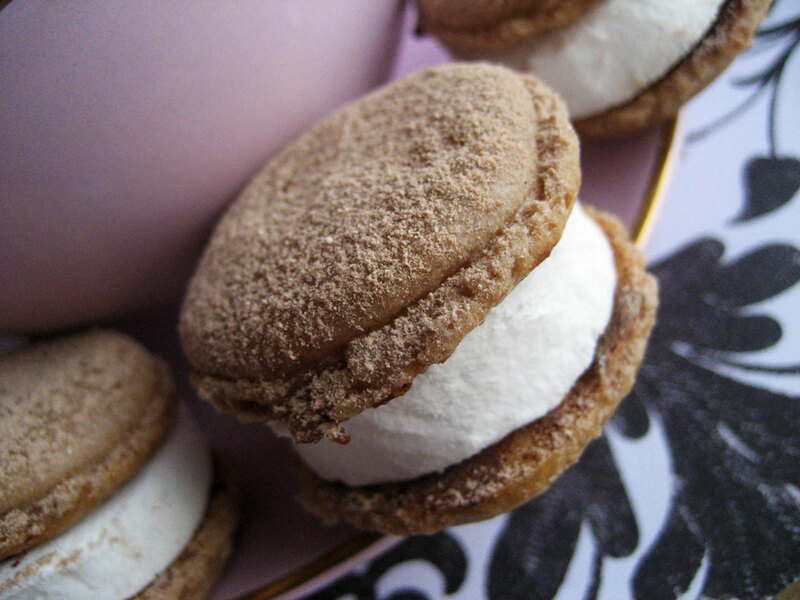 I think I saw somewhere a Chocolate dipped Mac, so you’re just one step away from a beautiful Mallow-Macaron marraige. I’ve Got to try this one sometime. I thought they were smores at first, but hot chocolate sounds just as good! Your macarons look fabulous – Awesome job! Even though I’m not careful enough to be a good baker I got it into my head that I wanted to learn how to make macarons. And then I watched this Daring Bakers macaron meltdown and started having doubts. Maybe it is the recipe–maybe I could pull off the David Leibowitz? 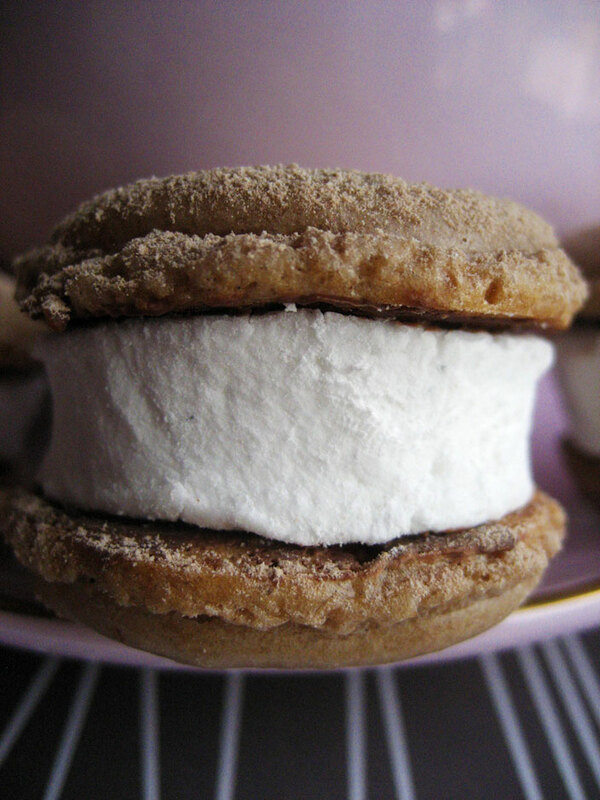 Anyway, your hot chocolate marshmallow confections look scrumptious. 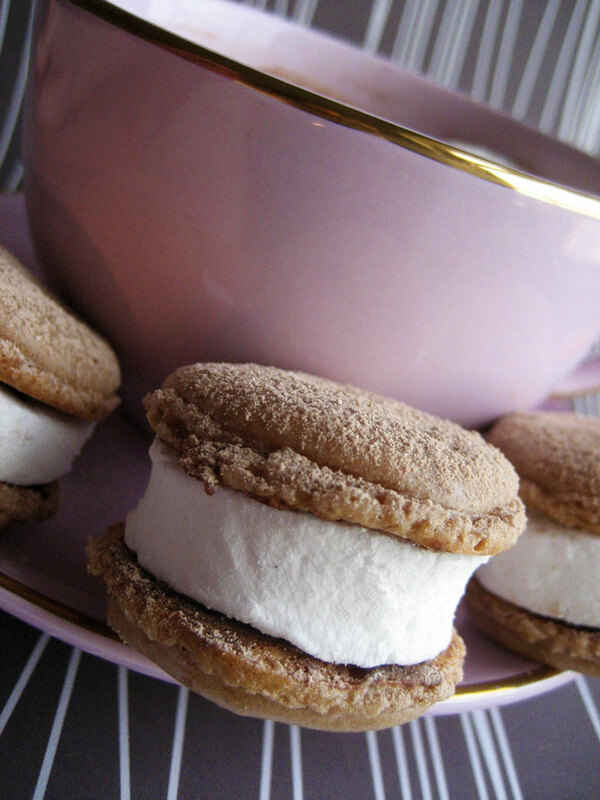 WOW..hot chocolate macarons with a vanilla bean marshmallows are not only creative, but super duper comforting and yummy! They look beautiful too! Great job!! Hot chocolate and marshmallows.. what a interesting combination!! French version of s’mores :)).. Love it! Amazing how a slighting different ratio of ingredients could mess up so many people’s macarons. I love the hot chocolate marshmallow, tasty! Now that kind of filling sounds like the best sort possible! I absolutely love it, and I’ll have to try it some time. Macarons are tough to make – congratulations. I could go for one paired with hot chocolate right now! I had the same problem with the daring bakers recipe! I have made macaroons before that turned out just fine but the DB recipe came out horrrible! this batch looks great! glad you have a more successful recipe to fall back on! (www.acookonthefunnyside.com). I recently had some with caramel in the middle – fantastic.